Get paid to gather crops. 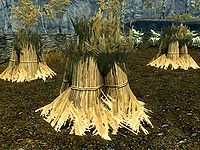 If you talk to one of the quest givers, they will have one or more dialogue options to sell them crops — one for each sellable crop that you currently have in your inventory. Each quest giver accepts specific crops that are grown on that farm, as listed in the above table. Several crops besides wheat are included in the quest. The "quest" consists of selecting one of the dialogue options, thus selling crops to the farmer. The implication is that you are being paid for harvesting crops from the farm, but in reality gathering or harvesting the crops is irrelevant. The farmers will accept vegetables from any source — those on the farm that they had previously harvested, ones that you found deep in an ancient tomb, ones that you pickpocketed from the farmer, or ones that you stole from the farm's kitchen table. In short, "Sell Vegetables" would be a more appropriate title than "Gather Wheat". Farmers always take all samples of the specified crop that are in your inventory. If you want to sell only a portion of your crops, store that portion elsewhere before talking to the farmer. Farmers will purchase any stolen samples. The amount purchased is not limited by the farmer's available gold. The farmers always pay you the base value of the crops, regardless of your Speech skill and perks. This is the only way for low-level characters to receive money for various vegetables that cost 1 gold. You never gain any Speech experience for the sale. After harvesting, crops will regrow when the farm respawns after ten days. The reward for completing this "quest" is however much money you earn for the sale of your collected vegetables. This is not leveled, as it is the base value of the crops that is being used. Thus, your "reward" depends upon number of crops and the type of crop sold. This quest is one of a limited number of options for making money if you are trying to intentionally avoid leveling up non-combat skills such as Speech. This quest can be repeated indefinitely.